Deputy Information Minister Fahngon withdrew his lawsuit filed against lawmakers. The lawsuit was filed after lawmakers ordered his detention on contempt charge. He was charged with the contempt after he failed to honor a legislative summon without providing a reason. The staffer in question from the House was accused of photographing Deputy Minister Fahngon at a local entertainment center in Paynesville. It was reported that the deputy minister had used invectives on Representatives Edwin M. Snowe who tried to intervene on behalf of his staff. The lawsuit claiming US$2.5M in damages was filed on behalf of the deputy minister at the 6th Judicial Civil Law Court at the Temple Justice by his legal counsels led by Cllrs. Frances Johnson Morris and Sam Cooper. 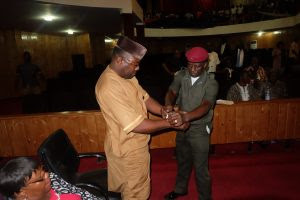 In his complaint to the court, Fahngon prayed the court to hold the lawmakers liable for the disgrace, humiliation, embarrassment, mental anguish, torture which he claimed the lawmakers meted against him. According to Fahngon, the damage he suffered at the hands of the lawmakers are irreversible and unqualifiable as his wife, children and ailing mother have suffered tremendous mental anguish. In the wake of the lawsuit, on September 25, 2018 Fahngon’s lawyers again filed petition to the 6th Civil Law Court under the caption notice of voluntary discontinuance.